What if you could install a small device under your car hood and improve your fuel economy by 50 percent? With today's soaring gas prices, a device like that sounds pretty good. Almost too good, in fact. These widely-advertised devices, known variously as a "hydrogen generator" or "hydrogen booster," claim to be able to use electricity from your car battery to split water into its components of oxygen and hydrogen. This supposedly forms what is called "Browns Gas." Scientists say the idea is preposterous, with one saying the energy created would "not amount to a hill of beans." Perhaps the most notorious Web site promoting the concept is Water4Gas.com. Created by a gentleman who calls himself Ozzie Freedom, the site is a 12,000-word sales pitch for two electronic books advertised at $97.00. The books supposedly explain how you can build your own system that will "take EXCESS energy out of the car's battery or alternator (in other words very low current that the engine does not feel) and use this electricity to generate a very small amount of Hydrogen per minute. What that Hydrogen does is help split the gasoline/air mixture droplets into a finer mist - thus helping it burn more efficiently and more completely." What kind of mileage improvements? Well, the Water4Gas site claims that you'll be able to double your gas mileage. However, one claim says that the system "has boosted MPG by as much as 185% on a Chevy 4WD truck"
Those are pretty big claims for a device made out of a Mason jar and baking soda, so we contacted Water4Gas by both phone and e-mail, sending a list of questions to Mr. Freedom. Our inquiries went unanswered. 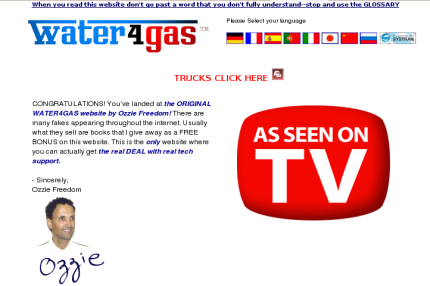 Doing a Web search for "water4gas" or "Ozzie Freedom" brings up page after page of search results and advertisements with headlines such as, "Is Water4Gas a Scam?" or "Water4Gas Reviewed," not to mention a wealth of videos that claim to show the device in action. It doesn't take long to realize that the "articles" and "reviews" appear to be sales pitches masquerading as unbiased reviews. Some sites present themselves as mechanics giving free advice to motorists. Presenting a possible clue as to where all these sites come from, a site called waterfuelx.com instructs sales affiliates on how to increase sales, recommending that the affiliate create a "review page" and list the waterfuelx product as the number one choice because "reviewing the product will mean monster [sales] conversions." All of these hydrogen booster sites have one thing in common: Even though they claim the "hydrogen-booster process" has been around a hundred years, they don't include any scientific studies or expert testimony to support their claim that the process improves gas mileage. In fact, the Water4Gas site specifically says that you shouldn't listen to "experts." Instead, Mr. Freedom says that you should just order his books. And just who is the mysterious Mr. Freedom? According to the bio on his Web site, he was formerly known as Eyal Siman-Tov, and Water4Gas is not his first online venture. In 2006, he ran a Web site called Magnet4cash.com. It promised that you could "finance your wildest dreams WITHOUT loans," with the goal "to educate you on little-known methods to make fast cash legally"
Mr. Freedom also invented the "Spongebee," which he describes as "the new all-American flying craze." Further, he is the founder of something called Sane Computers. That Web site has the headline, "New Mind-Blowing Invention Puts An End To... Your Computer Frustrations!" Additionally, Freedom's portfolio lists many awards, including the "Sponsor For Total Freedom" by the International Association of Scientologists. Freedom's advice to ignore the experts notwithstanding, we checked in with a few. "All of these device/schemes seem to promote adding hydrogen to improve the combustion process. There is no way it can improve fuel economy by 50%, or even 5%," said Dr. Robert Sawyer, Professor of Energy Emeritus at the University of California, Berkeley . Dr. Sawyer said that he has been reviewing gas-saving devices since he first joined the faculty at UC-Berkeley, more than 40 years ago, and to see a change in MPG comes as no surprise. "One would expect to see a small increase or decrease (a few percent) in fuel economy from all of these devices, purely the result of test variability. However, people will put a device on their car and automatically change the way they drive. This in itself will improve fuel economy simply because a person is driving slower, etc.," Sawyer said. All of the experts we spoke with had serious problems with the wording on the Web sites promoting the Water4Gas concept. "The Web sites I saw used a little bit of truth mixed in with a lot of false statements," said Dr. John Kramlich, Professor of Mechanical Engineering at the University of Washington College of Engineering. "People need to forget about all the 'testimonials' they see because the only way to know if a device helps at all is to use a dynamometer. You not only need to test the MPG, but also what is happening to the combustion process of the engine, and the test has to be done numerous times." When we showed the instructions and claims to Dr. Andrew A. Frank, he had difficulty holding back the laughter. "It shows the desperation people feel!" said Frank, Professor of Mechanical and Aeronautical Engineering at the University of California, Davis. "This has been around for years, but it didn't work back then and it won't work now," Dr. Frank said. "It's such a very small amount of hydrogen-oxygen gas that it is impossible to have any real effect on combustion." Frank went on to relay a story from his youth. "Back in the 50's, water injection was a big thing because the P-51 Mustang aircraft used the process. The P-51 used a very high engine compression and on heavy loads, the engine would knock. The water injection did give the P-51 engine more power and it stopped the knocking." "Curious people like me started to modify our own cars, and guess what? It did get rid of the knocking, but it also took a ton of water. It also messed up the timing because internal combustion engines aren't designed for these things. In short, all it did was create a negative force on the engine, even though the knocking stopped." We asked Dr. Frank about all the positive "reviews" and "testimonials" that have flooded the Internet. "A normal everyday driver can't accurately measure the MPG of their car. Each tank of gas might vary the MPG by as much as 20%, based on the time of day, road conditions, etc.," Frank stated. "I saw one 'test' that showed a driver filling up the tank, driving 20 miles and then stopping to top off the tank. You can't measure anything this way because the air in the tank could easily be 100% off." Dr. Frank also made note of what every other expert has said — a car battery can't create enough energy to have any measurable effect. "These devices simply cannot generate enough hydrogen or oxygen to amount to a hill of beans. A 12-volt car battery might create some bubbles, but beyond that, a standard car battery isn't powerful enough to do anything," he said. "Here's a good example that people should keep in mind," Frank said. "Even with the most expensive and sophisticated energy recovery systems, such as on some diesel trucks, you will only see about a 5% increase in fuel mileage." In fact, some Canadian truckers use hydrogen boosters, but they shell out up to $15,000 for the technology. In addition, the Canadian government performed scientific testing on the device and found that it reduced fuel consumption by only 4%. David Greene, energy expert and Corporate Fellow at Oak Ridge National Laboratory concurred. He said that yes, people can see an improvement, but "the potential for efficiency improvement by more rapid combustion is nowhere near the kinds of claims these Web sites make." Even if a person could tweak a device to get a few percent improvements in MPG, what kind of other problems might they be causing? "You are also causing the engine to work harder, plain and simple," said Greene. The experts also said to be wary of Web sites that use selective "studies" to promote their product. Many sites are referencing material from the Society of Automotive Engineers (SAE). "I'm very active with that group and often times the SAE papers have a very narrow scope," said Dr. Thomas Asmus, retired Senior Research Executive with DaimlerChrysler Corporation and a current member of the Fuel Economy Panel for the National Academy of Science. "These hydrogen-on-demand Web sites are picking and choosing which SAE factoids to use, but if you added it all up, you would have nothing." A recognized expert in fuel efficiency and engine combustion, Dr. Asmus said that these devices, "mix in a little hydrogen with fuel and can make a difference, but considering the amount of water used and that we're talking about a 12-volt battery, the maximum improvement (if any) would be no more than 2%." And what about the claims of this being "suppressed" technology? "This stuff has been around forever and it's been researched to death. It's a simple electrolyzer that could quite possibly cause more energy to be used than if you didn't use the device. It's as 'scammish' as anything I have ever seen," Asmus said. In June, Honda made news with the introduction of its first hydrogen fuel cell car, an incredibly sophisticated, and incredibly expensive technology. Those who don't pay much attention to details may think the Honda project lends credence to the Water4Gas concept. But the battery-powered cars are, in fact, powered by a hydrogen fuel that, while essentially made from water, is the product of a process much more complex and expensive than anything described on the gas-from-water sites. In fact, getting water anywhere near gasoline is bad news for an engine. The slightest bit of water in your gas tank can cause huge problems. The gas-from-water sites may be the newest kid on the block but they join a long list of supposed fuel-efficiency products that just don't make the grade, consumer protection officials warn. "When gasoline prices rise, consumers often look for ways to improve fuel efficiency," the Federal Trade Commission said in a recent consumer alert. "Although there are practical steps you can take to increase gas mileage, you should be wary of any gas-saving claims for automotive devices or oil and gas additives. Even for the few gas-saving products that have been found to work, the savings have been small."